The Mountain Training Rock Climbing Instructor Training (RCIT) is a 3-day course. 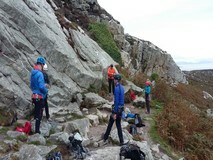 The Mountain Training Rock Climbing Instructor Assessment (RCIA) is a 3-day course. A qualified instructor can teach climbing skills, take people climbing, bouldering and abseiling and manage groups safely in these activities. It is valid throughout the United Kingdom and Ireland and is recognised by the Adventure Activities Licensing Scheme.